Cortland is the Executive Director of Cornerstone Farms. She grew up in Hunt Country Virginia. Her mother, an accomplished equestrian herself, started Cortland showing in walk-trot classes on her TB Jumper at the age of four on the West Coast. Taking to horses quickly, she spent the rest of her childhood on the East Coast H/J circuits, came up through the Pony Hunter & Equitation divisions, did Vaulting on the national level, and then moved over to Eventing in her teens. 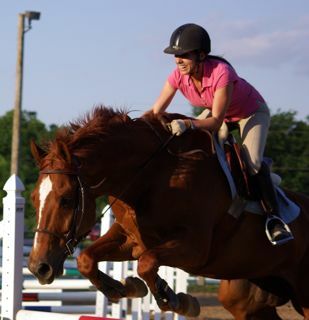 Cortland is an ARIA Certified Level III Hunt Seat & Show Jumping Instructor (Beginner thru Advanced – 4’6) and ran the Bridge the Divide therapeutic riding program from 2005 – 2015. Mckayla has won year-end USHJA affiliate championships every season since she was 9, and won the prestigious MOHJO and MHSA High Point Hunter Horse/Pony of the Year as well as the High Point Equitation Rider of the Year. She’s taken several ponies and horses to year-end championships over her Junior career. As a rider who has always prepped, groomed and shown on her own, she is able to teach new students everything they need to learn the sport. Students love her cheerfulness, patience and seemingly endless supply of smiles. Parents love her ability to transfer knowledge through simple, progressive exercises, attention to detail and safety, and the positive attitude she brings to her teaching environment. David leads our Board of Directors. He is a Collegiate Regional Strategist for the MBC and leads the Summer Missions program for MO college students. He also pastors the Crossing at Cornerstone, the church that meets here at the Farm. It is his desire to help make Cornerstone Farms a place for people to gather together and experience community. David has a Masters degree in Theology and infuses practical spirituality into the everyday operations of Cornerstone.